Sitting here on this sunny winter day and letting what's left of my mind wander, it landed on a few bottles I can't remember posting on this blog. Here's five desirable applied top western medicines. Hope you enjoy the picture. 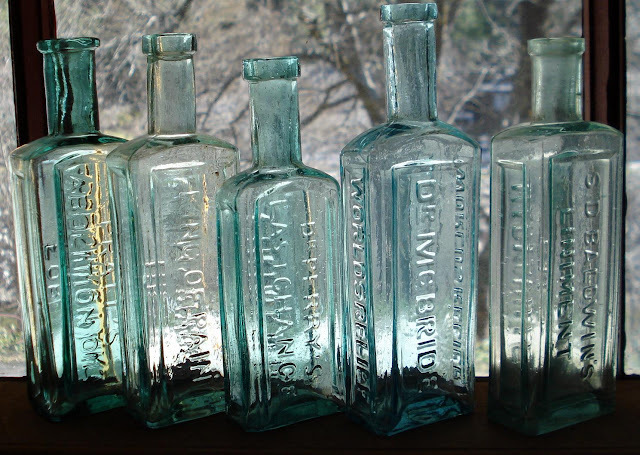 From left to right: Pratt's Abolition Oil / For Abolishing Pain - Dr. J.J. McBride / King of Pain - Dr. Perry's Last Chance / Linemint - Dr. McBride / Worlds Relief - S.D. Baldwin Liniment / Marysville Cal. nice group... I dig that last chance liniment bottle... would love to "dig" one literally...!